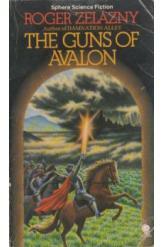 The Guns of Avalon by Roger Zelazny, Sci Fi. Book is in good condition, all pages intact. Corwin of Amber must return to his kingom, now that he has escaped his imprisonment by the usurper Eric, his own brother. Regaining the throne of Amber will be difficult, as first Corwin must confront the Circle of Evil that bars his path. Part of the Amber series.